Technology has gone beyond our Imaginations. Although am not so surprised yet, because as far as am concerned technology still has along way to go before they could impress me, until I am able to download my food from the web," then I can be surprised. Lol.. I want introduce BlueStacks to you. BlueStacks is currently the best way to run Android apps on Windows. It doesn’t replace your entire operating system. Instead, it runs Android apps within a window on your Windows desktop. This allows you to use Android apps just like any other program. BlueStacks also includes support for easy installation of apps from Google Play, so the process is as seamless as possible. Even better, BlueStacks runs Android apps and games with surprisingly good performance. 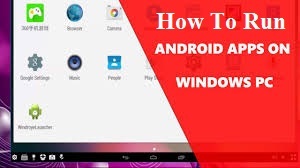 Very simple steps on how you can run android Apps on PC. With the help of BlueStacks you can comfortably run your apk files on desktops or laptops. First, with your PC/Laptop visit BlueStacks.com and download the software that is going to enable you run two different OS on one machine. After downloading and installing the free App (BlueStacks) interface, just run the application and wait until it finish installation. After successful installation, you can start playing around with games, surf the web, play music and run android applications discretely from android app market on PC with the help of BlueStacks. Note: After you installed and run your BlueStacks App, that is when you can look for games and applications you wish and install. With these steps, you can now play any cool android games on your laptop's or PC.